Cape Cutter 19 Association Forum • View topic - "Theo's Future" Our adopted charity. "Theo's Future" Our adopted charity. 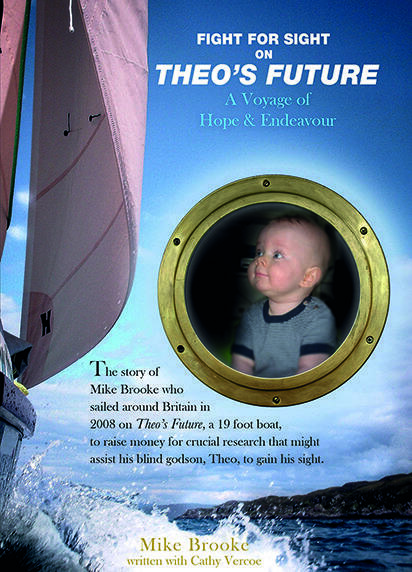 Colonel Mike Brooke has published an account of his voyage around Great Britain in a 19-foot cutter to raise money for Moorfields Hospital and the UCL Institute of Opthalmology to research gene therapy to combat congenital blindness, which has affected his godson among thousands of others. The proceeds from the book will go to the charities Fight for Sight and the Cetacean Research and Rescue Unit, dedicated to the welfare, conservation and protection of whales, dolphins and porpoises, a charity dear to his late son, Simon. The book can be ordered directly from Mike on 01243 572127 for £12.95 plus £3.95 postage and packaging. Bought the book after meeting Mike at the Southhampton boat show, what a lovely bloke , inspiring book, do read it. He has done 11 Round Britain Lectures this year and has 4 planned for 2015. Medway YC Fri 21st Aug 2015. Mike tells a good yarn and the lectures which are illustrated with slides and video are both entertaining and informative. Highly recommended. He has still got "Fight for Sight on Theo's Future" books for sale and would be delighted to mail them out in time Christmas. Special offer £10.00 + £1.95 pp - the perfect nautical Xmas present and a 'must read' for CC owners! Hi Dennis, I can thoroughly recommend Mike's talk (as I know you and several CC19 owners can too)... I heard him at the AGM of Friends of Chichester Harbour last year. You will remember within the 'virtual committee' discussions last year I suggested £1 from each new membership being donated to this charity. After some consultation it was decided not to pursue this idea at the time. I promised to make a personal donation to the charity of £1 per new member to the CC19A who signed up in the 12 month period from December 2014 to now..... So my question is how many new members have paid a £25 subscription to CC19A in the last 12 months? Chris Wicks wrote: So my question is how many new members have paid a £25 subscription to CC19A in the last 12 months? Re: "Theo's Future" Our adopted charity. Mike is bringing his talk to Lymington Town Sailing Club on the 25th March 2015 if anyone is close enough.